An oropharynx lesion biopsy is surgery in which tissue from an abnormal growth or mouth sore is removed and checked for problems. Painkiller or numbing medicine is first applied to the area. For large sores or sores of the throat, general anesthesia may be needed. This means you will be asleep during the procedure. All or part of the problem area (lesion) is removed. It is sent to the laboratory to check for problems. If a growth in the mouth or throat needs to be removed, the biopsy will be done first. This is followed by the actual removal of the growth. If a simple painkiller or local numbing medicine is to be used, there is no special preparation. If the test is part of a growth removal or if general anesthesia is used, you will likely be asked not to eat for 6 to 8 hours before the test. You may feel pressure or tugging while the tissue is being removed. After the numbness wears off, the area may be sore for a few days. 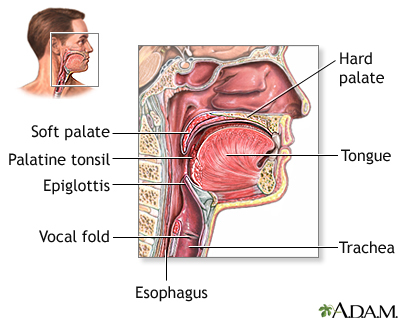 This test is done to determine the cause of a sore (lesion) in the throat. This test is only done when there is an abnormal tissue area. If there is bleeding, the blood vessels may be sealed (cauterized) with an electric current or laser. Avoid hot or spicy food after the biopsy. Lee FE-H, Treanor JJ. Viral infections. In: Broaddus VC, Mason RJ, Ernst JD, et al, eds. Murray & Nadel's Textbook of Respiratory Medicine. 6th ed. Philadelphia, PA: Elsevier Saunders; 2016:chap 32. Sinha P, Harreus U. Malignant neoplasms of the oropharynx. In: Flint PW, Haughey BH, Lund V, et al, eds. Cummings Otolaryngology: Head & Neck Surgery. 6th ed. Philadelphia, PA: Elsevier Saunders; 2015:chap 97. Tang Ho, MD, Assistant Professor, Division of Facial Plastic and Reconstructive Surgery, Department of Otolaryngology - Head and Neck Surgery, The University of Texas Medical School at Houston, Houston, TX. Also reviewed by David Zieve, MD, MHA, Isla Ogilvie, PhD, and the A.D.A.M. Editorial team.